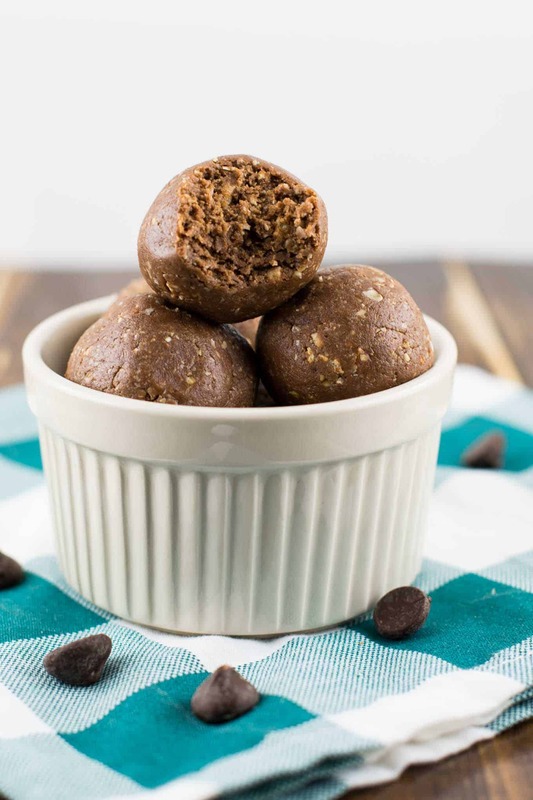 These Chocolate peanut butter protein balls are made with all natural ingredients and can be made in minutes. My go to recipe for a protein packed snack or dessert when I am craving something sweet! Desserts can be one of my weaknesses. While I don’t always overindulge, I tend to want something sweet after every lunch and dinner. Heck, every night that I get my toddler successfully to sleep, I feel like I deserve something sweet as a reward! If I’m not careful though, too much sugar can leave me feeling tired and draggy. So many packaged protein bars are packed full of artificial sugar and make me feel awful! As a vegetarian, it can be hard sometimes to make sure that I get enough protein in a day. And as a breastfeeding mom? Always. Starving. Forever. My husband is a landscaper and ultra runner, so he eats for 2. 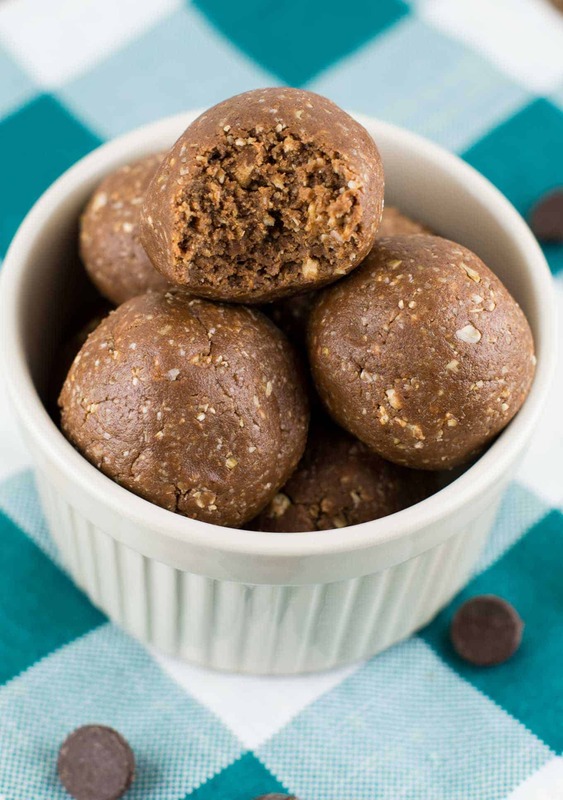 I have started to make us more protein snacks like these protein balls or homemade protein bars! They are so convenient, healthy, and delicious. I love these protein balls because they taste like a rich dessert. They are free of refined sugar and are good for you too! I love eating these if I need a snack throughout the day, or as a dessert after a meal. First, mix together peanut butter, maple syrup, and vanilla extract. Make sure that you use all natural peanut butter. When reading the label, the only ingredients should say peanuts and salt. So many packaged peanut butters (even organic ones!) have added sugar. There is absolutely no need for this, and I always make sure to buy my peanut butter unsweetened. It doesn’t need any sugar! Once you have mixed your wet ingredients, add the cacao powder and protein powder and mix until combined. Add oat flour, cereal, and salt, and mix it all into a batter (the mixture should be crumbly). Form batter into balls, and use your hands to roll them. Store in the fridge or freezer in an airtight container for a quick and healthy snack! They’re also great for a pre or post workout snack! I love the texture of these in the freezer, but you could also store them in the fridge. 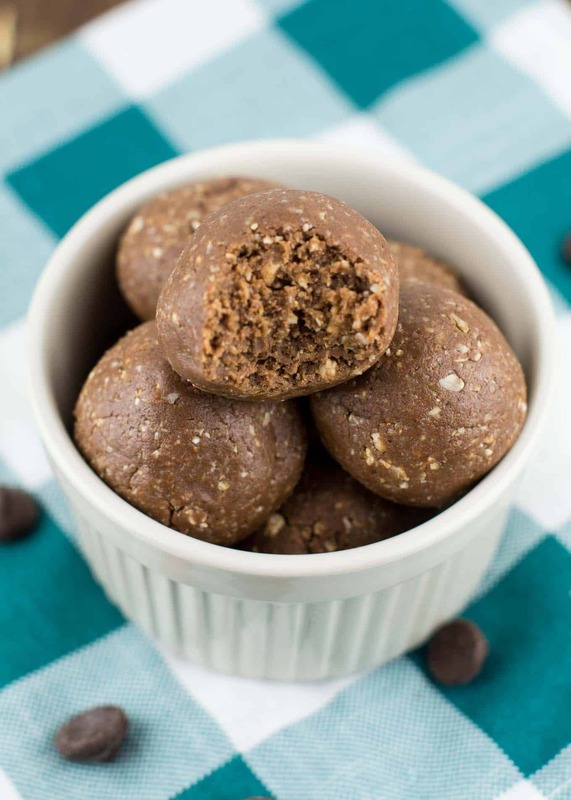 Try these to replace those sugar-filled protein bars that are so easy to buy! For more protein ball recipes, try our cookies and cream protein balls and our chocolate protein balls! Looking for more healthy protein packed treats? Here are some reader favorites! 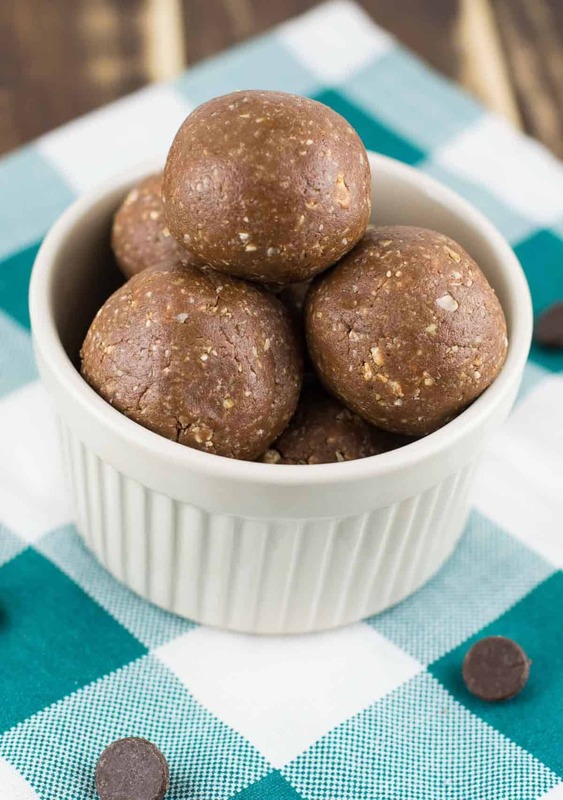 Healthy no bake chocolate peanut butter protein balls - perfect for a snack or dessert! You can make these in the food processor as well. Just add all dry ingredients and pulse, then add wet ingredients. I have found I like making them better with just a hand mixer, and so I have changed the instructions to reflect that method. Looks yummy! What should I do if I have milk chocolate flavored protein powder? Should I leave out the cocoa powder? You could either leave it out or substitute the amount of cacao powder with more protein powder. I think that would be best to help the texture stay the same. These are Perfect! I routinely make protein balls for my four kids, but am saddened at how quickly they are gone. This recipe makes a decent amount, and the added grain fiber of Cheerios is a bonus. Thank you! so glad you enjoyed the recipe Rachel! Instead of using the cereal I went for an even healthier option and blended a handful of almonds (I was going to use cashews but I didn’t have any) in my nutribullet, then added them. Aside from this, they are delicious and a perfect snack to have after school, or after a workout! Great recipe! Sounds like a delicious swap:) So glad you enjoyed the recipe!